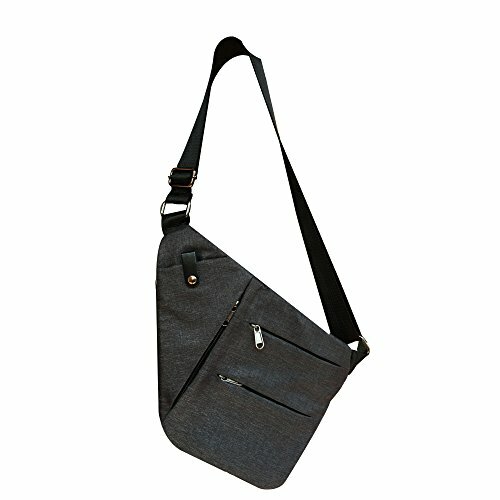 ☛This is an ambidextrous sling bag for quick and hands-free carry. (Velcro in the bag, you can paste it yourself). ☛You can take the bag as upgraded Neasyth small sling backpack.the capablity let you can get more necessity organized,even for the diaper bag. ★Why choose Neasyth Military Tactical Backpack? Neasyth is a registered trademark in the United States. We are committed to provide our customers with high-quality products and quality after-sales service. If you are not satisfied with our products and services, we will provide you with a perfect solution after contacting us. 【High Quality Material】Tactical sling bag comes with free tactical USA flag patch together. It's made of durable 600 D polyster(oxford cloth),water-resistant and durable. 【Unique Desige】Tactical bag with adjustable and comfortable single shoulder strap, and also has two smaller straps to help reduce the sway of the bag while moving as small military rover shoulder sling backpack. 【Shoulder Backpack Capacity】Tactical assualt sling pack size-12 * 9.5 * 6 inch (Stretch H*W*D), enough for carrying 9.7 iPad,notepad, And contain keychain, wallet, cell phone, flashlight, gloves, bottle of water, chargers etc. on a daily basis. 【Tactical Used Occasion】Military rucksack with velcro in the concealed back compartment. Awesome as a pistol sling range bag for 1-2 handguns and lots of ammo or as tactical assault pack. 【Convenient Anyone】Single shoulder backpack with Four compartment for the bare necessities is a great small everyday carry tactical diaper bag or travel sling bag to take on small trips or go hammocking for a little bit.